What I'm Wearing: Never Fully Dressed Neon Back Sweater, Topshop Floral Trousers & Boots & Marni for H&M Necklace. Finally the sun graced us with is presence this weekend, so naturally I had to wear every colour under the sun to embrace to full glory of this summer-esque weather. If you guys follow me on Twitter or Instagram you would have managed to get a sneak peak of all the behind the scenes goings on at the GIRL STOLE shoot. 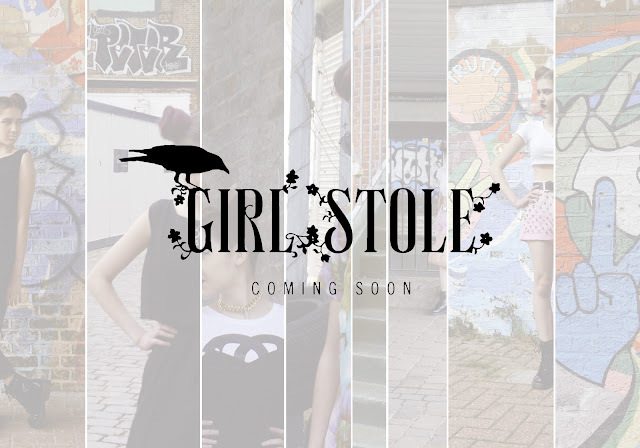 Lauren and Lereese founders of GIRL STOLE, are stocking my new t-shirt line on their soon to launch website (check it out here) and with the sun shining and clothes all up and ready, team girl stole laid their claim over in East London to shoot the amazing look book. Such a talented team of photographers, make-up and stylists, the Canal was morphed into a scene of 90's grunge right in-front of our eyes. One of a kind vintage pieces, gorgeous jewellery from Oh My Clumsy Heart and of course a little input from me, GIRLSTOLE is the one to watch. Follow @GIRLSTOLE on twitter & instagram for the most up to date info on the launch, and seriously guys...watch this space. GO GIRL STOLE! Oh and before I forget. For all my UK readers, make sure to use you're promo code FREEUKSHIP for free UK delivery on my online store before it runs out. Happy shopping y'all! Great pants and gorgeous background of your pics ! wow you look amazing those pants are so awesome- gorg! xO!